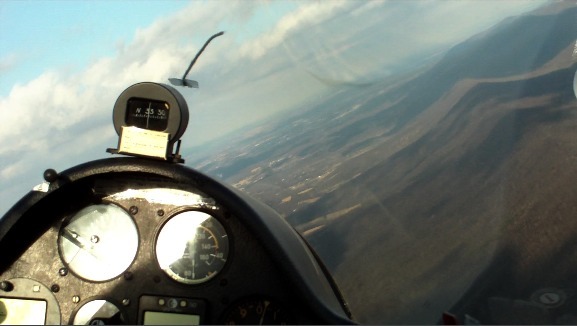 I figured out how to mount an HD video camera in my glider. With about 90 minutes of battery life it can record an entire medium-length flight. Of course an hour of HD video ends up being huge, and it can also be somewhat dull, so I chopped it up to show just some of the interesting bits. 1920x1080 (540MB) - Click this one if you have a fast computer, a fast internet connection, and at least a 23" screen. 1280x720 (369MB) - Click this one for an intermediate format which will play on most newer computers with reasonably sized screens. 720x480 (82MB) - Click this one for the lowest quality setting which should be playable on most computers with any broadband connection. I ran the northern end of the Masanutten ridge near Front Royal, VA in my ASW-20C. It was a great ridge day, strong on the ridge but reasonable on the ground for takeoff and landing. Pushed it up to 100kts in places and had plenty of room to go faster still. Total time in the air was a bit over an hour. Video shot with an Aiptek A-HD+. Sound goes wonky when there are titles or transitions for some reason, but fortunately I only have a few of them in the video. For those unfamiliar with glider flying, the incessant beeping you hear is an audio rate-of-climb indicator.